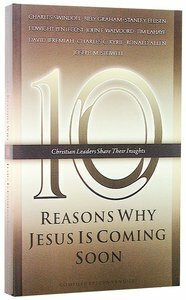 About "10 Reasons Why Jesus is Coming Soon"
The 10 Series addresses the greatest concerns and interests of Christians today and offers clear, relevant, biblical solutions and responses. Every book features ten chapters, each written by a highly respected Christian leader. Here, some of today's most respected authors-Tim LaHaye, Billy Graham, John Valvoord, David Jeremiah, Charles Swindoll, and others-reveal the 10 Reasons Jesus Is Coming Soon. This compilation of previously published writings gathers the most timely insights and organizes them in one readily available, easily accessible (and affordable) volume so believers have the biblical perspective on today's events just when they need it the most.